Welcome to Day #6 of Chocolate and Halloween wEEKs. And happy spooky* Friday the 13th to you. 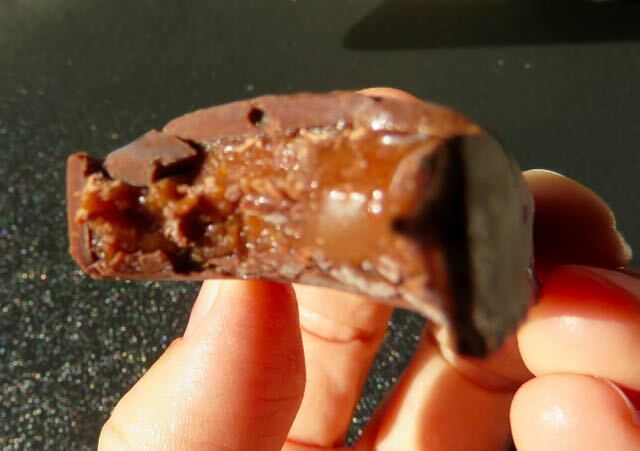 We've been examining traditional candy bars and healthier alternatives this week. And, healthier means different things to different people. 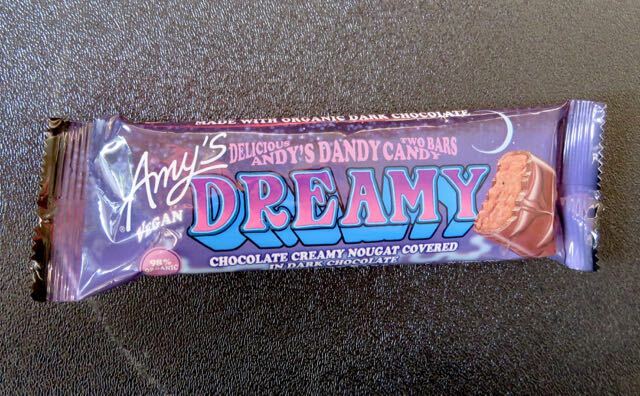 Today's Andy's** Dandy Candy Dreamy bar was from Amy's Kitchen Inc. (Petaluma, CA). While similar to a traditional candy bar in appearance, it's been substantially improved (and I would say it was healthier too). The vegan Dreamy bar contained no 1.) high fructose corn syrup, 2.) preservatives or 3.) GMOs. Several companies have made a move away from the first two, not so much with the third. Amy's updated take on candy bars shows how this market has evolved. Their bars are gluten free, vegan and 98% organic ingredients, and can still satisfy a sweet tooth (via organic cane sugar and tapioca syrup). It was sweet; but the high sugar contain (found in almost all nougat-centered candy bars) was also balanced by the use of dark chocolate and the addition of soy protein. The two smaller bars in one package made sharing and portion control easier (100 calories in each bar). There were no dairy, wheat, gluten, or nut ingredients listed; but the packaging did contain the: "May contain traces of tree nuts" statement. *Scarier than Halloween or Friday the 13th this week are the real life wildfires that are burning around some of the Amy's facilities in Northern California. I called to convey good thoughts, and as of this writing the facilities were fine, although many employees were being affected. ** The name Andy's Dandy Candy came from Andy and Rachel Berliner. who founded the original company in 1987 and named it after their daughter, Amy. The privately-held, family business has grown over the years and produces a line of frozen foods, entrees, soups, and chocolates that offer consumers organic, gluten free and low-sodium options.